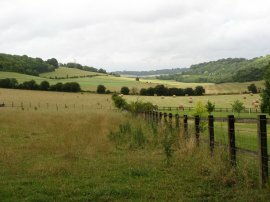 We did this walk on 6th July 2008, meeting up at Luddesdown before heading over to Barnes Street to resume our walk along the Wealdway. It was a grey and suprisingly cool morning as we set off from Barnes Street, photo 1, and almost all the group were wearing either jackets or fleeces. From our parking place we had just a short walk down the road before we took a footpath off to the left that headed over fields towards the small River Bourne. Having crossed a small bridge the route of the Wealdway turns to the right to follow the bank of the river down to Pierce Mill Lane. Approaching the road we had to pass through a very overgrown section of path that had tall nettles and brambles blocking the route and I had to walk with my arms held up in front of my face to avoid being stung. Encountering such paths are one of the reasons why now, however hot the weather, I never wear shorts when out walking. 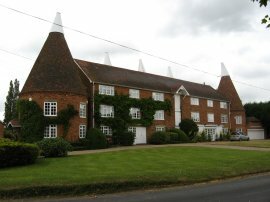 Having finally negotiated our way to the road the route turns to the left and follows the road on to a junction by Kent House Place, photo 2, a large group of Oast Houses now converted into houses, where the route turns right along Hatches Lane. A short distance further on at a bend in the road the Weladway takes a footpath that runs to the left over fields, photo 3. Leaving the fields the path passes through the apple orchards at Crowhurst farm, photo 4, before continuing ahead past the farm building to briefly join a road. Here the route turns to the left, then right joining the farm track that leads up to Peckham Place Farm. Reaching the farms buildings the path tunrs to the left, skirting a paddock that had a donkey in it before once again turning to th eright and heading past more fields to join an area containing a large number of big poly tunnels, photo 5, that were being used to grow strawberries. 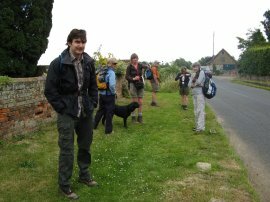 Although we had not walked that far we were already making slow progress with Simon and Olena lagging considerably behind the rest of the group. At the poly tunnels we stopped and waited for them to catch up and to ensure that they were still on the right path as there were a number of small turns through the farmland which could have thrown them off course. Whilst we were waiting we took the opportunity to sample a very few of the strawberries from under the tunnels which were incredibly tasty as only freshly picked fruit can be. 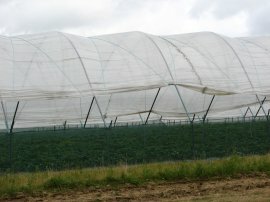 The strawberry plants were in a number of stages, some in flower, some with ripe fruit and others with the fruit starting to rot. 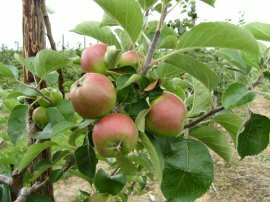 The weather had become steadily greyer as we had been walking and while we were here we felt the first few drops of rain from which the end of the polytunnels provided useful shelter. 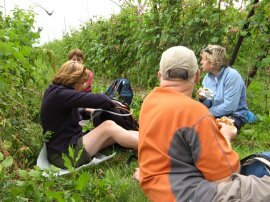 With the group re-united we continued past the polytunnels and out of over another more open field down to the A26. Crossing over the road the Weladway continued past a large pond nr Gove Farm, photo 6 and over a number of fields towards the village of West Peckham. Reaching the road in West Peckham we stopped for a group photo by the village sign before turning to our left and following the road down to St Dunstan's Church, photo 7. 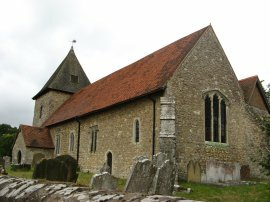 At West Peckham the Wealdway joined the route of the Greensand Way for a short distance. I had walked the Kent stretch of this Recreational Trail in the early 90's and could vaguely remember having walked through West Peckham which was slightly better than the stretch I walked along when doing the Stour Valley walk which I had no recollection of whatsoever. One of the advantages of writing these pages is that they do help fix the walks in my memory as well as helping to provided a memory for later. 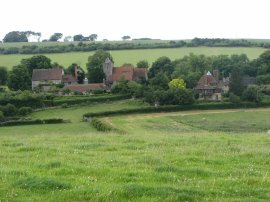 I definitely want to walk the Greensand Way again before too long, ideally starting from Ham Street which is where I finished last time, and include the Surrey stretch that I have not walked yet. From the church the route passes round the edge of the the village green before heading beside a field, photo 8, to briefly join another road. 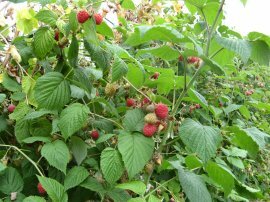 Heading up a track the Wealdway reached another area of polytunnels, this time covering raspberry canes which were laden with bright ripe red fruit, photo 9. The weather was still quite grey and rain loooked iminment and, even though it was a bit early for me, it was decided to stop and take our lunch under the shelter of the polytunnels, photo 10. 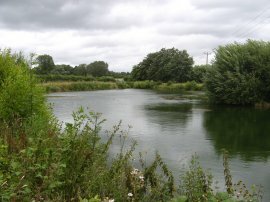 While we were eating it started to rain although not too heavily however not long after we had left our picnic spot it began raining considerably heavier and as we joined the path heading uphill to Gover Hill I was forced to stop and put my waterproofs on. Having done this though I soon felt very hot and sweaty and those with shorts had an advantage at this point. Crossing another road at Gover Hill the route heads up a track that passes through the western edge of Mereworth Woods. It was raining steadily but at least the trees kept of the worst of the rain however it was rather gloomy as we made our way through the woodland, photo 11. Leaving the woodland the Wealdway joins a minor road that runs through the village of Platt. Leaving the road the route heads up a driveway before taking a fence lined path that runs between gardens towards another section of woodland. Once again the walkers had got a bit spread out and myself and Anne waited for a bit to ensure the back markers were on the right route. The path once again briefly joins a road heading to the left before taking another footpath off to the right that runs down to the A20 in Wrothan Heath. Just before the road is reached the path passes under some railway lines where we waited once again, out of the rain, for the back markers who must have stopped as soon as they had got into view last time, to catch up. While a number of the group visited a shop for chocolate the rest of the group sheltered from the rain at a bus stop. It was one of those rather demoralising stretches of walking with slow going and poor weather although fortunately after this point this gradually picked up. Leaving the bus shelter we headed through another section of trees, across a road and on besides a couple of more fields to another road. Here the route turns to the left, follows the road round to the right, before taking a foot path off to the left. The path now runs through the edge of some trees along a path running parallel to the M26 motorway which was a little way to our left. 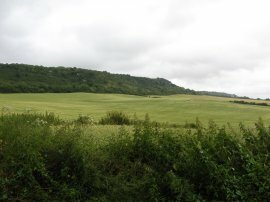 Occassionally there had been views over the North Downs which were now quite close, coupled with a succession of rain clouds passing overhead. Reaching a crossing track the route turns to the left to take a tunnel under the motorway before passing through a large sand quarry, photo 12, with workings on both sides of the path. 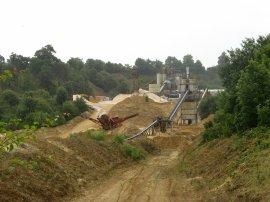 Back in 1968, the site now owned by Hanson Aggregates was used for an episode of Dr Who, standing in for the planet Dulkis. Normally I take loads of photos when out walking however there was several miles between the last two photos and much of the description of this part of the walk has had to be written from memory rather than the photogrpahic evidence! Leaving the grounds of the sand quarry the Weladway turns to the right along the Trottiscliffe Road before taking a footpath off to the left that runs over fields towards Ryarsh Woods. 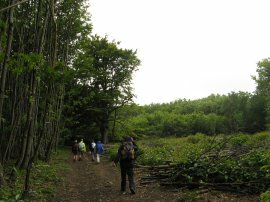 There had recently been some forestry work in the wood and the broad path through the woodland was covered with what look like long strips of bark and wood which made the surface rather difficult to walk over. Leaving the woodland the path then began heading besides fileds up towards the North Downs, passing by the Coldrum Longbarrow, photo 13. 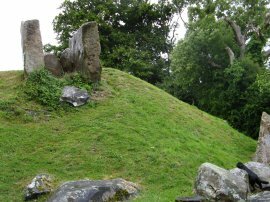 The longbarrow was constructed from the local Sarsen stone and was a communual burial place built during the Neolithic times, some 4000 years ago. me. 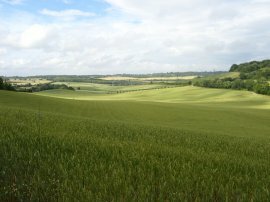 As we headed up to the downs there were good views over the gently rolling fields towards Medway Valley along the edge of the downs, photo 14. Reaching a driveway by a house we linked up with a section of the North Downs Way for about 50 yards, (that I had walked with Dave the weekend before), before the Wealdway takes a footpath off to the left that heads steeply up through trees towards the top of the North Downs. Having reached the top of the downs the path heads through the fairly level ground of Whitehorse Wood to eventually raeach the White Horse Road. Here the path turns to the right and then to the left, running besides fields to Leywood Road. 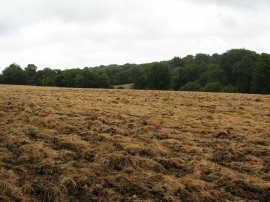 One of the fields, photo 15, had been recently ploughed which once again made the walking a bit tricky. Reaching the road we were confronted by a large double metal gate at the edge of the field with a padlock linking the two gates. With most of us having struggled over the gates Dave walked up and moved the unlocked padlock to open the gates for a far easier passage to the road. The route heads to the right along Leywood Road before taking a path that runs diagonally off to the right which makes its way past the edge of Lie Wood and through the edge of Luxon Wood. The weather was starting to brighten up at this point although there was still a lot of water on the greenery as we went by. Evenatually the path joins the road at Lockyers Hill on the edge of the small hamlet of Great Buckland. 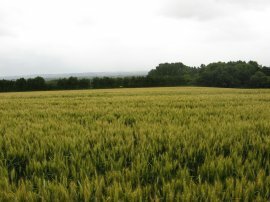 Ahead of us were good views stretching to the North over open fields, photo 16. 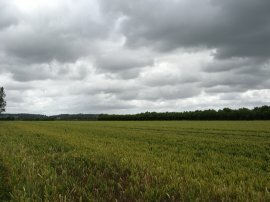 The route follows the road to the right, passing some houses before taking a footpath on the left that heads out over open fields across a broad valley known as the Bowling Alley, photo 17. Just before I left the road I was finally able to stop and take off my waterproofs as the sun at last started to break through the cloudy sky. Crossing over the valley the Wealdway heads gently uphill before taking a path that runs round the edge of a grassy field down to the village of Luddesdown, photo 18. 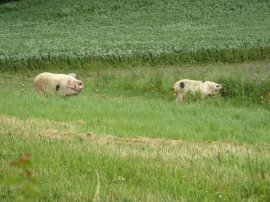 Just before we reached the village and our parking place by the chuch we passed an enclosure with two pigs within, looking very similar to the pigs from "Pass the Pigs", photo 19, I think this is a Double Trotter! Despite the earlier damp weather it had been a very pleasant end section to the walk and I came back a few weeks later to walk the same paths around Luddesdown with my wife. On that occassion the field by Luddesdown in photo 18 was full of cows. According to my GPS we had walked 14.8 miles when we reached the cars. Having started the walk crossing the South Downs by Eastbourne we were now over the North Downs as well with just a comparatively short stretch of path left down to the end of the walk at Gravesend to come.